The following content is sponsored by Acorn Influence as part of the #LoveBestFiends ambassador program. Regardless, all opinions below are genuine within the What I'm Gaming series. The following free app may offer in game purchases. Momma Told Me: Why bother picking it up if you're going to beat it in one night? I have an addictive personality. No, that doesn't mean people are drawn to me like a moth to the flame (ha, you see what I did there with the game theme?) It does, however, mean I tend to latch onto something and increase my interest at rapid levels until I'm burned out or have entirely exceeded said items practical uses. My regular readers know I was also raised a gamer- and that my taste in entertainment is quite eclectic. Just browse the numerous posts in our What I'm Streaming series and you'll discover I'll watch anything from a Hannibal Lector horror show to The Unbreakble Kimmy Schmidt and Parenthood. I've also begun steaming all of the original Munsters, circa 1964, so I dare you to figure me out- the only thing more eclectic than my taste in television and music is my interest in gaming. Don't mistake that for a lack of discretion- I am relentlessly critical of which games I will devote more than a few lives too. After all, I can listen to a CD or follow along with a television series while cleaning the house, editing blog photos, or making dinner. It's not as easy to feel productive while gaming. As a result all of my mobile games must be playable without timers (that is to say I can't game if there is a clock ticking away in the corner,) and able to be picked up or put down at a moment's notice. At the same time, I demand charming, vibrant graphics, a feeling of achievement through game progression, and a feeling of satisfaction whether I play for 2 minutes or 20. Best Fiends, but Seriously games meets all of my requirements and more. 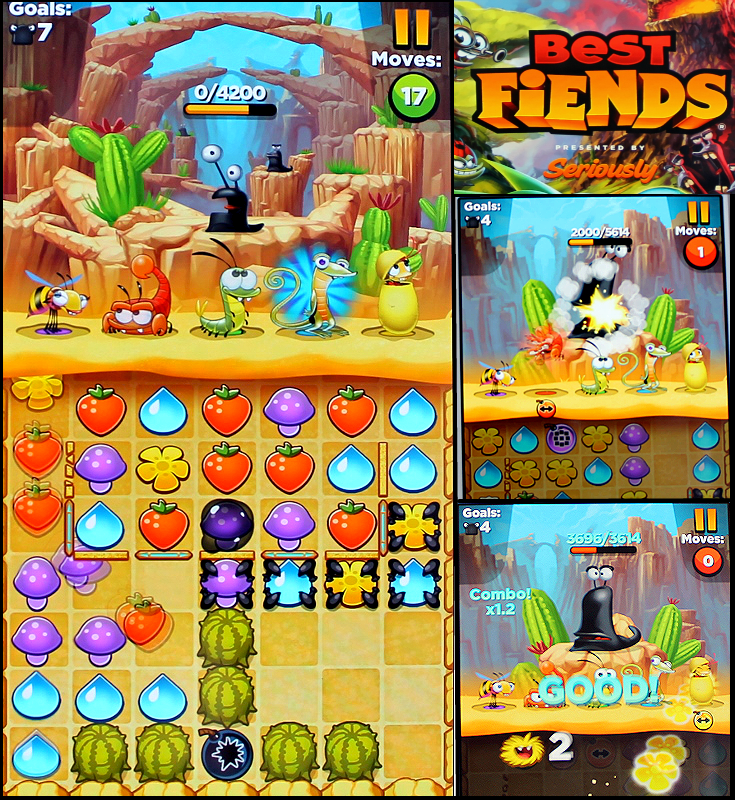 I don't normally play 'puzzle games,' but Best Fiends captured my gaming heart from the beginning with it's adorable bug (Fiend) characters and the steadily increasing range of board obstacles and goals. While the first few levels introduce you to the general background of the game (giant slugs are invading the Fiends home planet and they must band together to defend against them) I was happy to discover I wouldn't be regularly interrupted by cut scenes further down the line. The game's 'tutorial is built into the first 5 levels and new abilities and obstacles are easily explained with a simple swipe at the beginning of relevant rounds. In all, learning this color matching game is very unobtrusive and quite intuitive. So what makes this more than 'just another color matcher'? I consider myself very sharp, but the difficulty curb is pretty easy to climb. I noticed myself failing levels a few times before discovering a strategy to circumvent the round's unique obstacles. This gave me a feeling of difficulty without the frustration of spending weeks on one puzzle. 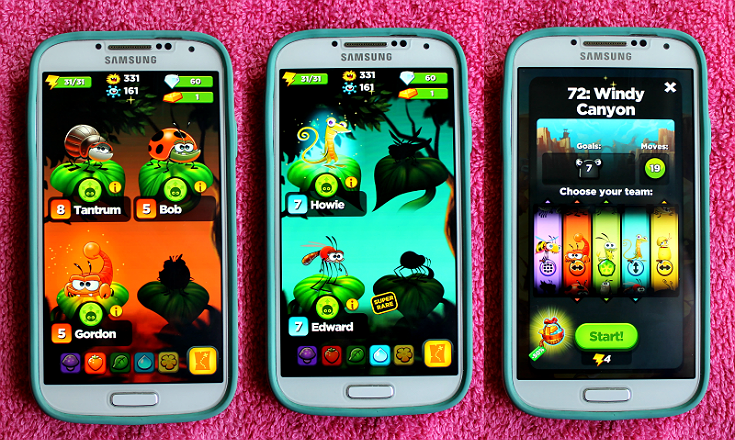 Most unique to this game is the strategy element of building up your team of Fiends (bugs and amphibians) by collecting mites to upgrade their attack power and range. Puzzles are broken down into color collection, obstacles broken through, and 'Slugs' defeated. Each character has their own unique attack power (per color matched) that will slowly break down the health of the slugs, thus defeating them. Players must pay attention to the characters they choose to use for each round as special attacks for the characters can vary from clearing entire rows vertically versus horizontally, or changing colors around them. Powering up your characters and selecting the best special attacks are key to moving forward. This also means you will, in theory, never need to pay to pass a level- simply go back and earn mites until you can level up your Fiends to progress. Aside from being fiendishly good fun (I did it again, see?) 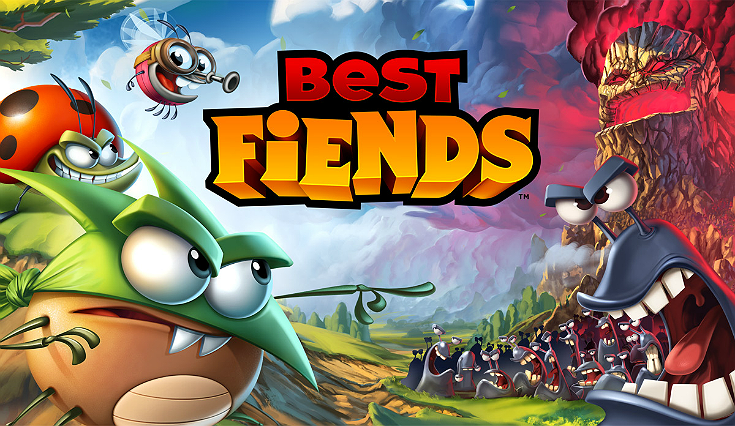 Best Fiends champions a very important charitable cause, Malaria No More. Through, very unobtrusive, opportunities to donate directly to the Malaria No More foundation, and an in game character that seeks to educate players, Best Fiends promotes awareness of a disease that remains one of the top contributors to child mortality worldwide. When you download Best Fiends you'll be able to play through 15 unique levels featuring the Malaria No More in game mascot, Edward the mosquito who has 'sworn off the red stuff for good,' and learn more about how you can help the Malaria No More foundation. Best Fiends has proven to be a wonderfully addictive game to compete against friends on the leader-boards, and keep my brain active with. The progressive problem solving, strategy, and puzzle aspects allow for me to play for chunks at night before bed, or attempt a level a few times in the waiting room at the doctor's office. And, not to brag, but I seem to be exceptionally god at it- I just hit level 95! 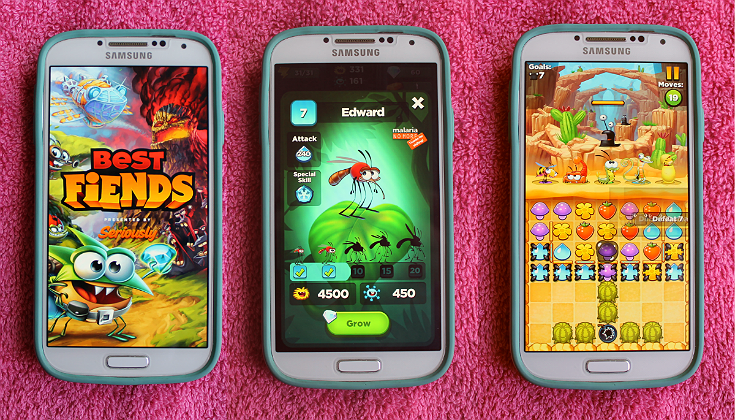 Best Fiends is available for free download through the Google Play, Apple App, and Amazon App stores, so why not download it today and join me in the way against the slugs? What are some of your favorite mobile games right now? 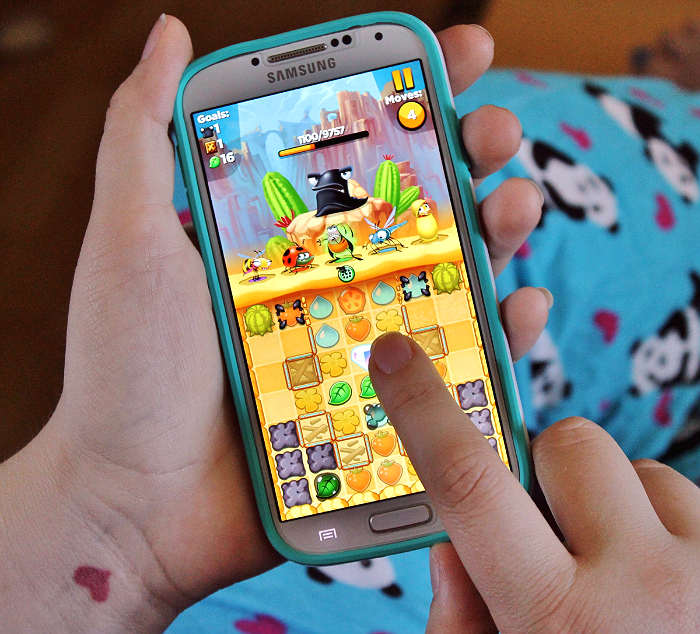 What Daughter Says: I love games that challenge me without frustrating me, it's a fine line- Best Fiends manages to meet! This looks like so much fun! I'm a big fan of puzzle games, especially when they look this cute! I love puzzle games, but like you hate when there is a ticker going down in the side. Plus, I need to be able to stop whenever needed. And, I certainly appreciate a game that can't be done in one night! 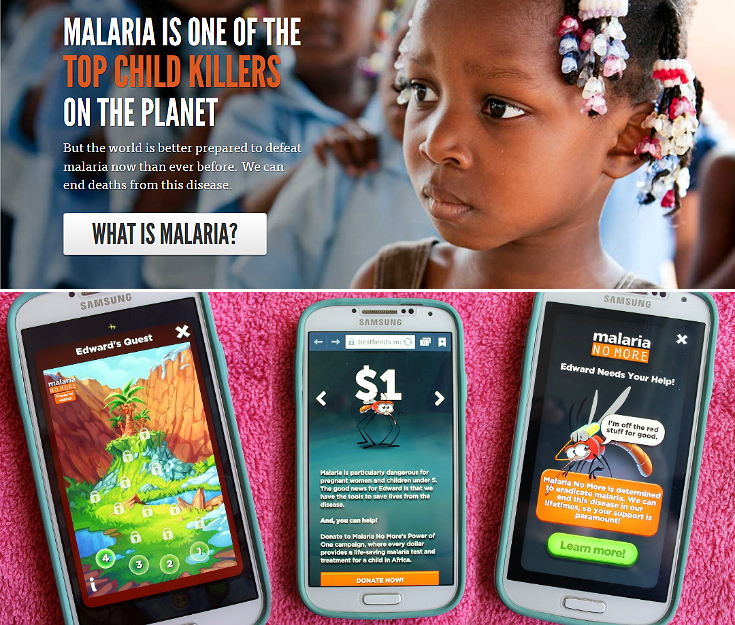 What a great tie-in to educate about Malaria with a game. I'll have to give this one a try. The one I am totally addicted to right now is Panda Pop. You have explained it so well I think even my old brain might be able to play it if I had a phone. I love that it has a charitable aspect. And the colors. I really like the bright colors. That looks like a fun game. I tend to get addicted to games as well, lol. That sounds like a fun game! I can see myself getting hooked on it really easily! This looks like a fun game. I love puzzle games, but they have to be cute. This is just about the most adorable puzzle game I've ever seen. I love all those little critters sitting up there! I've tried Farmville and Candy Crush and both over time just annoyed me. Farmville was ho-hum and Candy Crush becomes a little tedious and you reach a point where you just can't proceed. This game looks fun though. The graphics of this game are so cute! I love puzzle games and will have to give this one a try. This game looks like a lot of fun. I've been looking for a new puzzle game to try. I tried it and like it since it gives back to a good cause! I am always looking for fun games that the kids can play. I will have to download this onto their tablets I bet they would get a kick out of this game. This game looks awesome! I could totally see how it'd be easy to get addicted to it! I'm cracking up reading this because my husband is the exact same way. Once he picks up a game, he can't put it down until he's mastered it! I do not usually get much free time to enjoy mobile games and apps, but really like to play those that make me think and keep my brain working. This one sounds like it fits that description perfectly! I love playing mobile games. I'll have to go check that out! This looks like a great game to try. I am still playing Candy Crush. I like having games on my phone to pass the time when i have to wait. I will have to try this game. It looks like so much fun. I like to play Clash of Clans right now. I love puzzle games! This looks like it has the ability to stray me from Candy Crush... and that's really saying something! Looks like a fun game, and so colourful too! I'm taking a few flights tomorrow and I need something to do - I so need to download this. I'm sure it'll pass the time in the air! My daughter loves these games. She is an app freak an is always looking for new ones. Now that she is starting college, she will have to slow down. Those are so cute. Wait! I think I just them on my phone yesterday - I bet kids already discovered their latest addiction! This sounds like fun! I love that they built supporting a good cause into the game. We absolutely love puzzle game! I'll definitely have to let me kids know about this, thanks! I love games, but I am addictive, too. So... I have to try really hard to not play TOO much!